The Jack Kirby Collector always has something interesting in it but with all the great art included it can hardly fail to excite a Kirby fan. I thought I would write a brief comment about a couple of articles from the latest issue (JKC #52). The first concerns a short piece by John Morrow about the screen play “Fish in a Barrow”. I had previously posted on this play (A Simon and Kirby Screen Play) based on a copy belonging to Joe Simon. It seems however that Morrow has a somewhat different copy. John notes that his copy was 66 pages in length while the one I reported on was 77. Morrow’s description of the overall plot indicates it is the same play but obviously something has been changed. 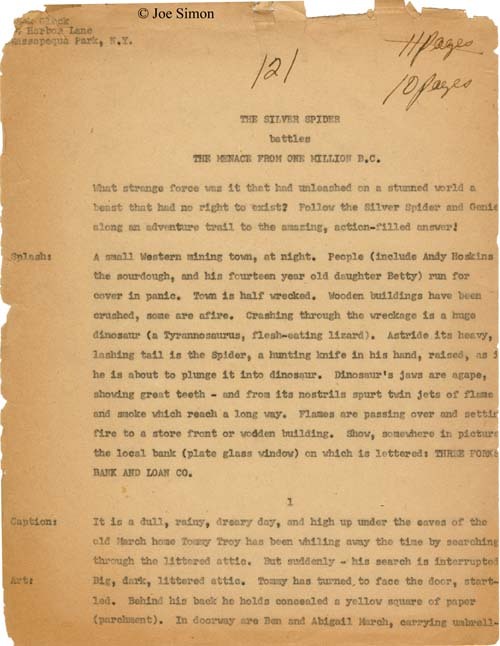 The JKC article includes an image of the first page of Morrow’s copy that provides a hint about what has happened. Morrow’s version of the story begins with two men exiting an elevator and proceeding down the corridor to an office. In Simon’s copy they are already in an office and instead it centers on the reactions initiated by the publisher’s unlighted cigar. Simon’s version seems more dramatic. Further since Simon’s version takes place in an office while Morrow’s goes from the elevator to an office, Simon’s version would seem better for a performance in the TV live plays that the piece seems intended. All that and the longer length of Simon’s version suggest that Joe’s copy is the more recent rewrite of John’s copy. The second comment I have to make concerns the article “Casting a Shadow” written by Adrian Day. 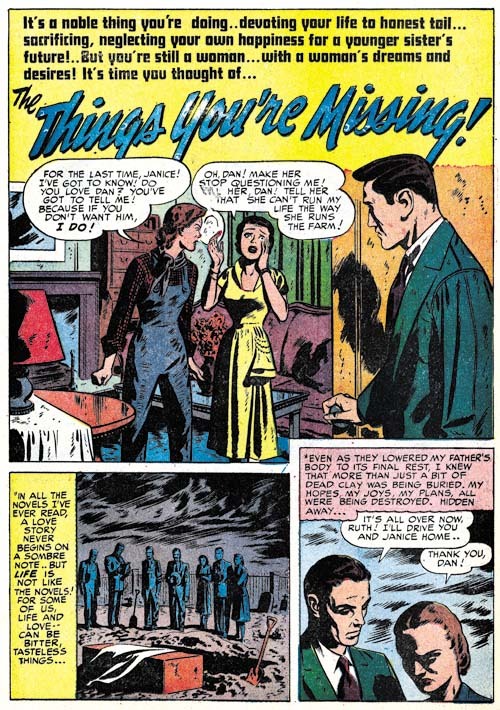 In it Day suggests that Kirby’s use of shadows in some of his later works was the results of the influence of a science fiction television show “The Outer Limits”. As presented it all seems very plausible and I have no problem with considering Kirby’s art reflecting outside influences. Unfortunately Adrian failed to consider earlier work from Kirby’s extensive career. 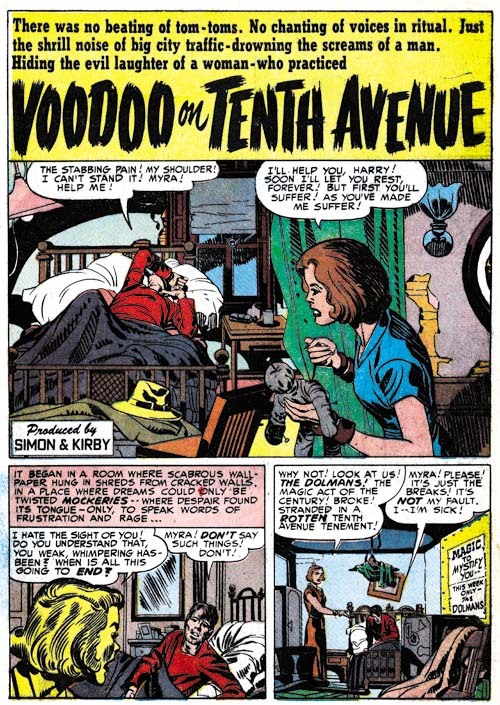 Simon and Kirby had a long history of the use of abstract shadows to enliven their comic art and it can be found not only in some of Jack’s earlier work but it was even applied to work by other artists working for Simon and Kirby productions. 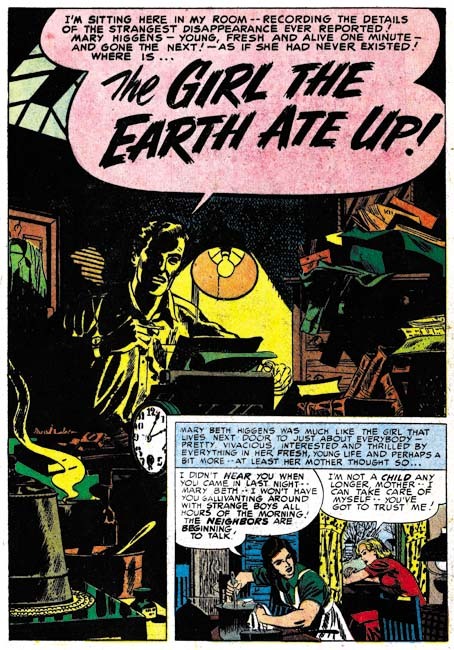 While the strange shadows on the couch in the image used by Day in his article (shown above) seem to be a late addition to Kirby’s repertoire, those on the walls are not. Note the way some are slightly curved; this was a common Simon and Kirby technique. For comparison I provide the line art for the cover for Young Romance #34 (June 1951) below. I should add that this is by no means the earliest example. Can there be any doubt about Kirby’s long use of seemingly inappropriate shadows? I suggest the absence of such shadows during the silver age was more a result of the way the inking of Kirby’s pencils was handled at that time. Besides the two romance titles, Simon and Kirby were also producing bimonthly Black Magic (for Prize) and Boys’ Ranch (for Harvey). At this point I believe it can safely be said that Joe and Jack had little to do with the Prize crime titles. 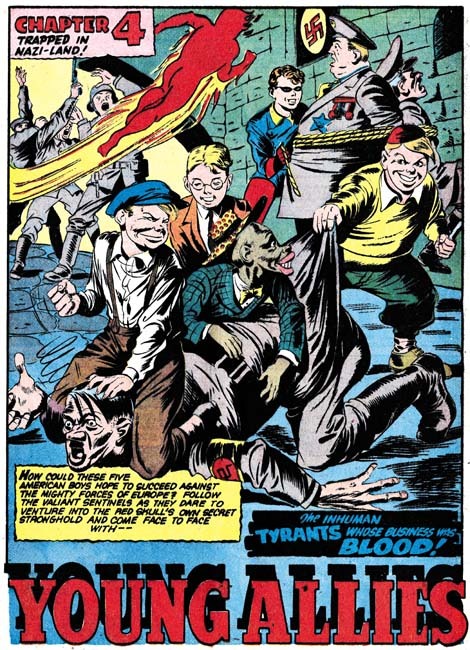 While Mort Meskin and Marvin Stein would appear in Prize comics both produced by Simon and Kirby and those that were not, they were the only artists that seemed to do so. 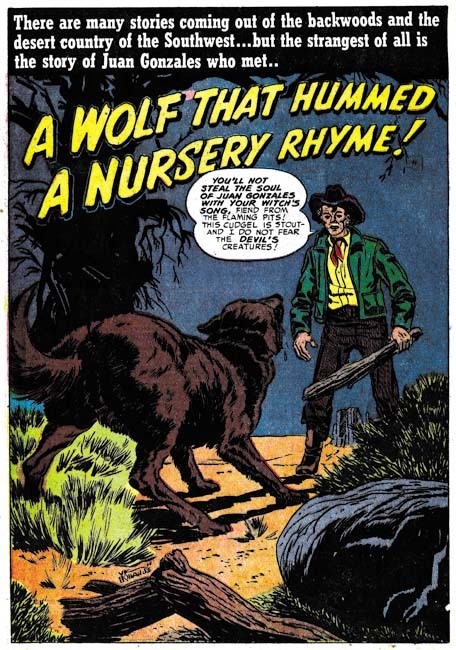 John Severin had been another artist that worked in both the romance and crime titles but at this point the only Prize title he was working on was Prize Comics Western (also not a Simon and Kirby production). Young Romance switched back to drawn covers for May and June (Young Love had already been using art covers). Both titles would revert to photographic covers for their July issues and would remain using photo covers until 1954. I really do not know what to make of YL consistently and YR sporadically using art covers for a period of about a year. In a certain respect Jack Kirby was the primary studio artist during this period as in fact he was during the entire time Joe and Jack produced comics together. Except for a period in 1954 and My Date #4, Jack would provide the art for the cover of all Simon and Kirby productions that did not use a photograph. 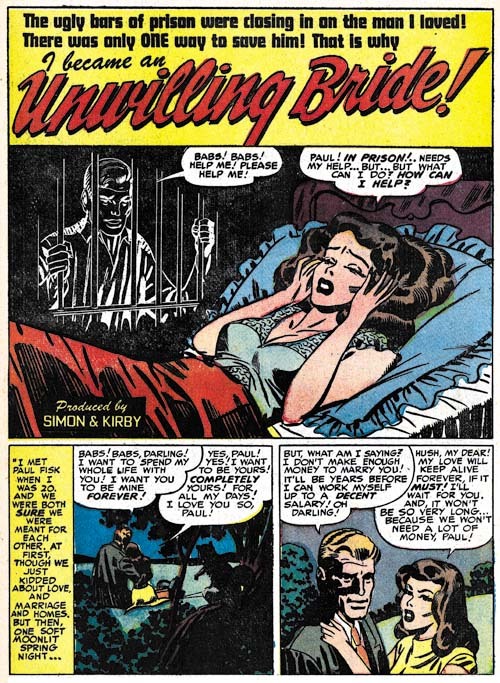 During this period Kirby would also do the lead story for all the issues of Young Romance and one for Young Love (YL #21). But if the total number of pages of art produced is used to judge who was the primary artist then Mort Meskin wins out be a large margin. For these six romance issue Jack did a total of 51 pages of art while Mort did 80. The difference is all the more striking with the knowledge that Meskin did all his own inking while Kirby did not. I will say that I feel that Meskin’s art sometimes suffers from his higher rate at producing art while Kirby always seems to provide high quality work no matter how many pages he drew. 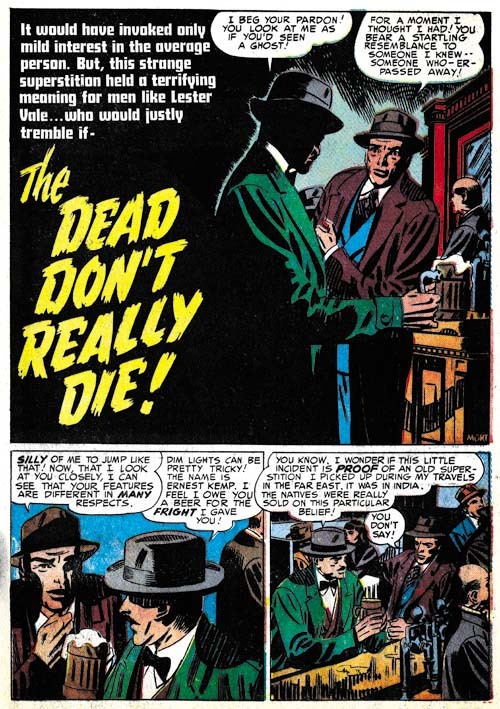 It also pays to compare Jack’s 51 pages with Bill Draut’s 36 and John Prentice’s 34 or 37 pages (the uncertainty about Prentice page count is due to the short feature “Will You Help Me?” from YL #21 which I will discuss below). Jack was still working at a high rate; it is just that Mort was even more exceptional. Marvin Stein is another contributor during this period with only 3 stories and 23 pages. There are 3 very short pieces (a total of 7 pages) that I have not been able provide artistic credits for. Perhaps others do not share my view, but I find Kirby’s confessional splashes powerful drawings despite their lack of action. While Kirby is generally (and quite reasonably) famous for his dynamic drawing it was a mark of his genius that he could be so effectively in such static compositions. Much of this has to do with Jack’s careful use of characterization. I have said it before but it is worth repeating, I do not agree with those who claim that Kirby did not draw beautiful women. 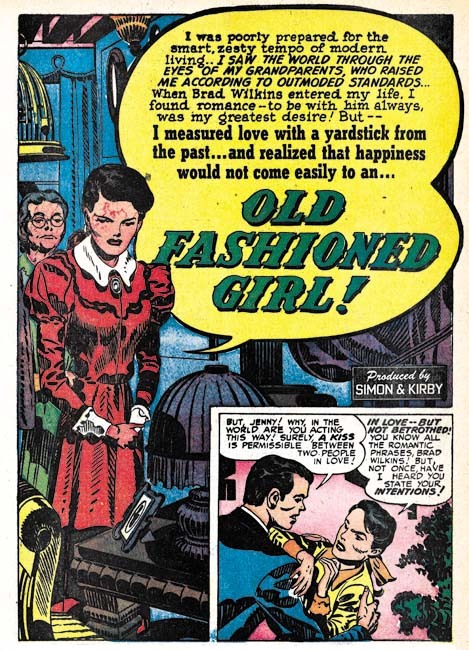 It is true the protagonist in the splash for “Old Fashioned Girl” does not have the type of attractiveness that would be found in a beauty pageant contestant. But her frail like form has its own beauty and most importantly is totally appropriate for her antique dress style. 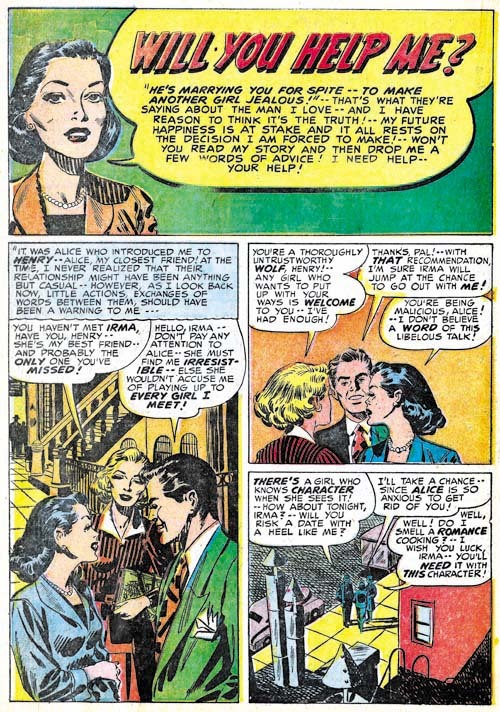 The thing is Kirby did not draw the same women over and over but created unique individuals that were well matched to the theme of the story. The woman’s downcast eyes and the demur way she holds her hands augment the characterization. The old woman looking on and all the antique surroundings complete the picture. If all that was not enough, Jack has added a small panel that is not a story panel but another means of showing the conflict between the lady’s old fashioned ways and what was then modern society. I feel that Jack Kirby’s romance splashes are much more interesting then the covers. I present the line art for the cover of YR #34 which is based on the “Old Fashioned Girl” story in a post above (My Two Cents). The reader can compare the two and reach their own conclusion. The splash for “Temptations of a Car Hop” provides a nice contrast to the one in “Old Fashioned Girl”. The protagonist was certainly meant to represent a thoroughly modern woman, or at least what would have been modern in 1951. However 58 years later and the car-hop has disappeared a casualty of the fast food drive through. I do remember them from my younger days but none that I ever visited had such and attractive waitress wearing such a short dress. With all the work I am doing for Titan’s Simon and Kirby library, I have not had time to devote to investigating the various inkers of Jack Kirby’s work. Still from time to time I come across a piece that just screams a particular inker. Such is the case with “All Work and No Love”. 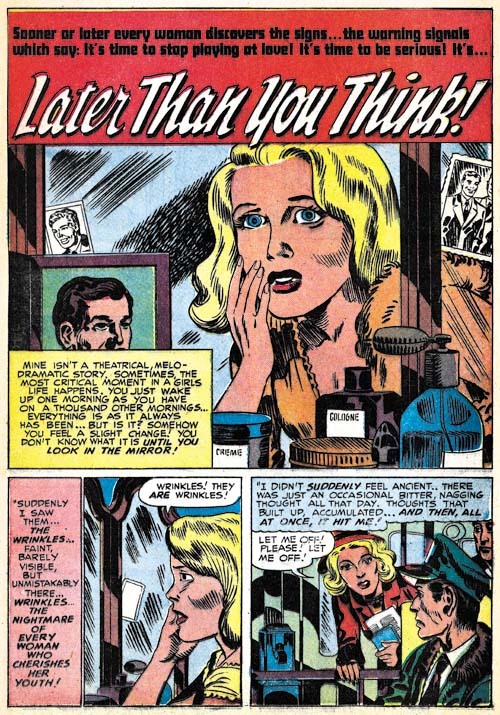 In the splash the simplicity of the woman’s eyes and eyebrows and the slight angle they have in relation to one another leaves little doubt that Marvin Stein was involved in the inking. The same sort of eyes appears elsewhere in the story as well. Also there are some cases where the eyebrow is extended into a crease of the forehead which is a trait often found in Stein’s own art. I should point out that inking of Kirby pencils in the Simon and Kirby studio was like an assembly line with various artists taking care of different chores. So when I say Marvin Stein inked this story I am saying no more then he was the one inker of this work that I have been able to identify but there are others that I have not. In this case Marvin seems to have done the outline inking, the first step in the inking process. Note however how the spotting uses the picket fence crosshatching, drop strings and shoulder blots that are characteristics of the Studio Style inking (see my Inking Glossary for explanations of the inking terminology that I use). Stein’s inking of his own work does not use such techniques. Further Stein’s own inking was a bit rough and lacked control. It would improve greatly in future years but at this point I cannot believe he could have been the artist that did the spotting. While I have frequently remarked how action is more often found in the romance stories Jack Kirby draws I do not want to leave the impression that action played no part in stories drawn by other studio artists. So I thought I would provide some examples. First up is a page by Mort Meskin. Meskin has his own unique and very stylized version of a slugging as can be seen in the second panel. Note in particular how the angular position of the victim’s head and how his legs are folded up beneath him. I say it is stylized both because Mort uses it over and over again and because it appears nothing like how a photograph a fight would look. I am not using the term stylized in a negative manner because I believe a comic artist job is to tell a story, not to try to produce a sequence of photorealistic images. With his technique Meskin has condensed several instants of time into one image (the victims head responding to being struck by the fist is the first instant, with the torso soon following and finally the loss of control of the legs as the effect of the knock out is completed). 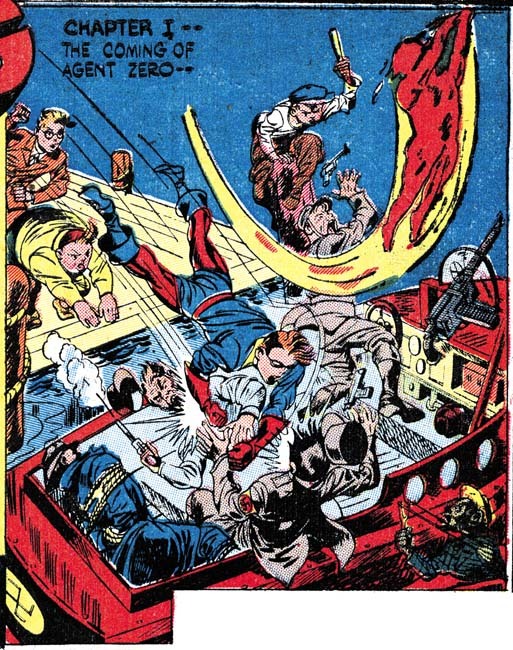 The second example of a fight comes from Bill Draut’s “Not in the Act”. Draut uses an interesting compositional device of presenting the fighters in depth. I am not sure where Bill got this idea but it is pretty effective. I do not believe I have seen Draut use it before so it is not as an important part of his repertoire as Meskin’s or Kirby’s more stylized slugging. The splash for “Cradle Robber” provides an example of a fight as portrayed by the more recently arrived studio artist. Actually calling it a fight is not quite correct as Prentice has chosen to present the moment just before the punch is thrown. The other thing about this splash is that it is actually a teaser as there would be no fight seen in the story. It is however the closest example of a fight that I could find by John Prentice in the period covered by this chapter. Mort Meskin is famous for his use of blacks but that does not always show up in his romance art. That may in part be a result of his high rate of art production. But it may also be because for Meskin telling the story properly had become a higher priority then making interesting art. Sometimes Meskin would have the best of both worlds (story and art) as in this page from “The Catskill Man-Chasers”. For many comic artists only night scenes would get an abundance of black but here Mort uses it to make the light parts so much brighter as would be appropriate for a hot summer day by the pool. Mort also uses it in the second panel to hide in plain sight Tom, the love interest of the story. Tom’s presence in the panel is not obvious at a glance because Mort only provides a silhouette but at closer examination the pipe clearly indicates that the shadowed figure is Tom. Starting with the second panel, Meskin moves in closer and closer so that the view progresses from a crowded scene to one that focuses on just the couple. 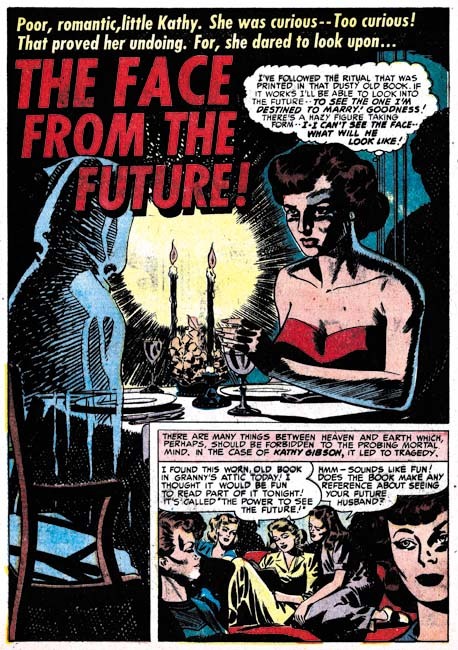 While Meskin is restricting the focus he is paradoxically increasing the use of black until in the final panel the reader can make out only a little of the faces. While Mort has obscured the features he has made the scene all the more intimate. It is a masterly orchestrated page all the more so because nobody else working for Simon and Kirby, including Kirby, worked blacks anything like this. Since John Prentice is a new addition to the Simon and Kirby studio it behooves me to begin to try to discredit the opinion that too many Kirby fans have that Jack supplied layouts for the various studio artists. While that is true for some of the more minor artists that Simon and Kirby occasionally used it is decidedly not true for the more common talented artists. 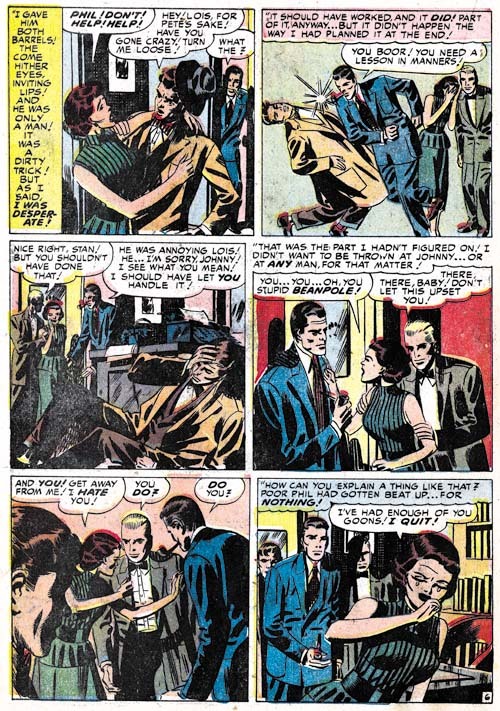 John Prentice certainly falls in the talented group and except for a special case from years later and from outside the romance genre Prentice did not work from Kirby layouts. 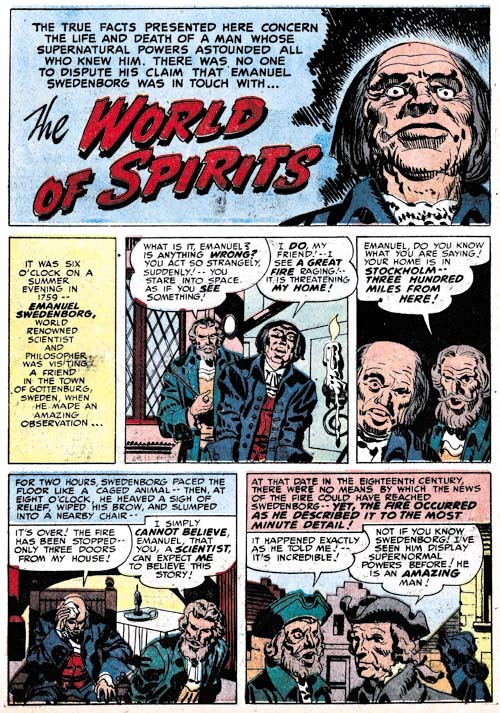 One piece of evidence in Prentice’s case comes from the dramatic close-ups like panel 3 in the page shown above. While Jack Kirby occasionally did close-ups they generally are not as radically cropped as Prentice often uses. It was not uncommon for Studio Style inking techniques to show up in splashes of stories of the artists that otherwise were inked with other brush mannerisms. Often I suspect it was the work of Joe or Jack stepping in to touch up the art. That is not however what I judge happened to “Cry Baby”. All the major features of the studio style are present in this page if not in the splash itself; picket fence crosshatching, drop strings, abstract shadow arch and shoulder blots (see my Inking Glossary). What makes me believe this was not the work of Simon or Kirby is the way the picket fence crosshatching is done particularly on the man’s jacket. The rails are not done in the standard way of the Studio Style but match Prentice’s cloth folds. The pickets vary in both spacing and execution in ways not typical of Simon and Kirby. This leads me to believe that the spotting was actually done by Prentice himself. I must admit I am uncertain what to make of “Will You Help Me?” from YL #21. The overall simplicity of the style is different then work assigned to Prentice yet the brunette has the elegant beauty so typical of John’s work. The inking of the splash panel looks like a combination of that by Prentice and another artist. The spotting of the hair is typical of Prentice’s technique but the cloth folds are not nor are the way they are arranged along the edge of her sleeve which suggests either Simon or Kirby. The inking in the first story panel all looks like it was done by Prentice. On the other hand the crosshatching in the last story panel is not typical of any of the parties considered so far. 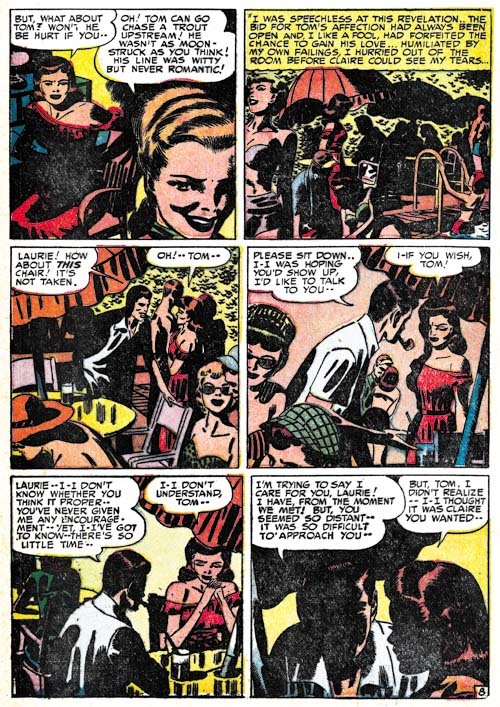 It is possible that Prentice is inking Kirby pencils but the way the brunette turns to talk to someone behind her is a common Prentice mannerism. The other possibility is that Prentice is working from Kirby layouts with which he takes liberties in some places. It could be that John did the pencils and final spotting but that the outline inking was done by someone else. At the present I am undecided except that John Prentice participated in the art in some fashion. I thought I would close off with an example of what Marvin Stein was doing during this period. The style is still typical of Stein’s early period but there are hints like the man in the second story panel that are typical of the style he would develop later. 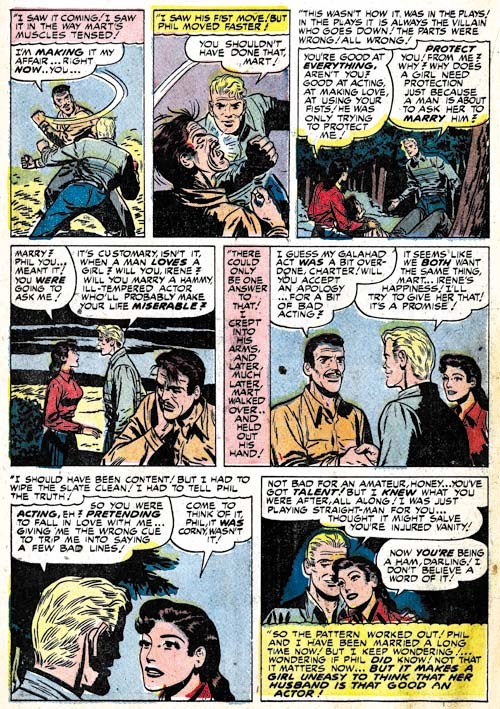 Besides Young Romance and Young Love, Simon and Kirby were also producing Black Magic and Boys’ Ranch during this period. 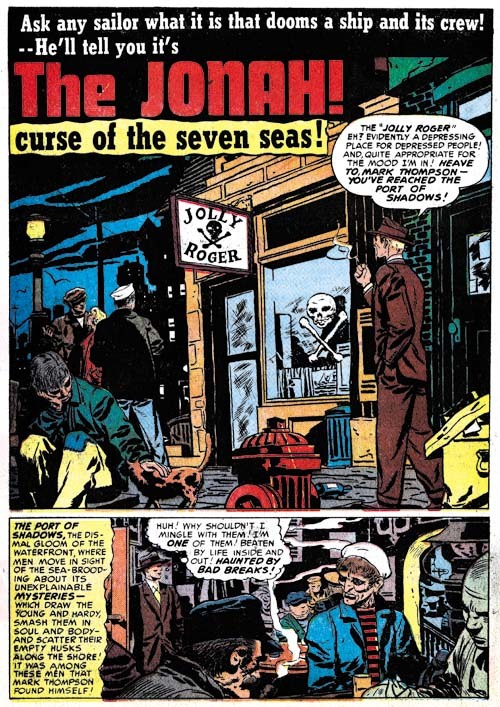 Jack Kirby supplied some covers for Headline and Justice Traps the Guilty so it is possible that Joe and Jack still had something to do with the Prize crime titles as well. 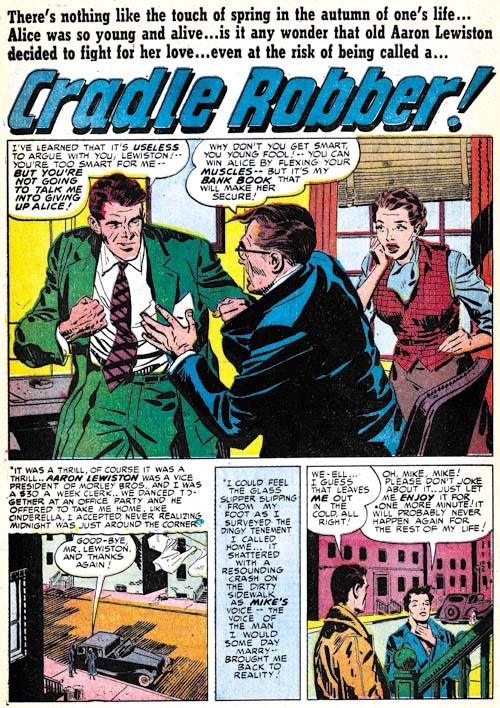 However Kirby, Draut and Starr, artists important to the other Simon and Kirby productions, did not appear in the crime titles. 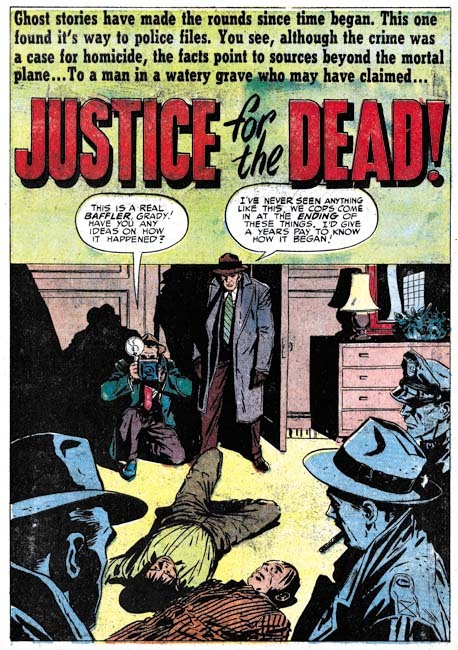 That plus the lack of a Simon and Kirby production cartouche seems to indicate that Headline and Justice Traps the Guilty were no longer produced by Joe and Jack. 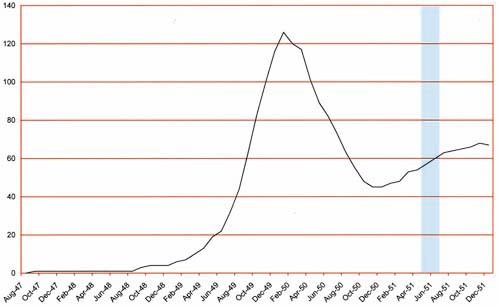 Romance comics in general were just starting to rebound from the relative low that followed the love glut. 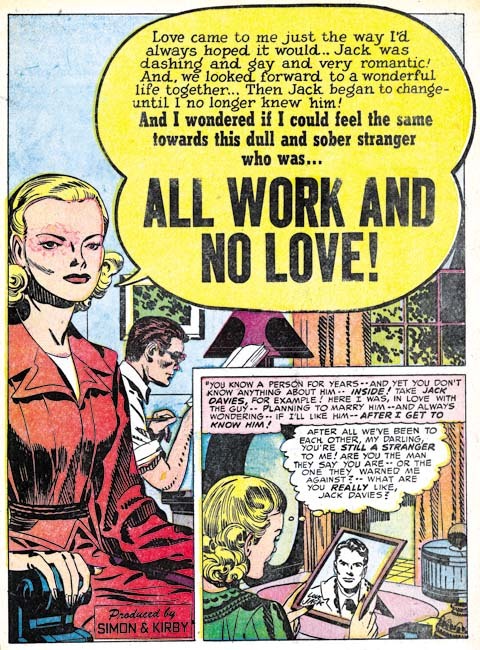 However with more then 45 titles, romance comics were still a lucrative part of the industry. Since both Young Romance and Young Love were both monthly titles it can be presumed that they were still selling quite well. Since Joe Simon did not do much penciling anymore, Jack Kirby was by one definition the primary artist for the studio. Jack would provide the cover art that was still appearing on Young Love (Young Romance had converted back to using photographic covers). 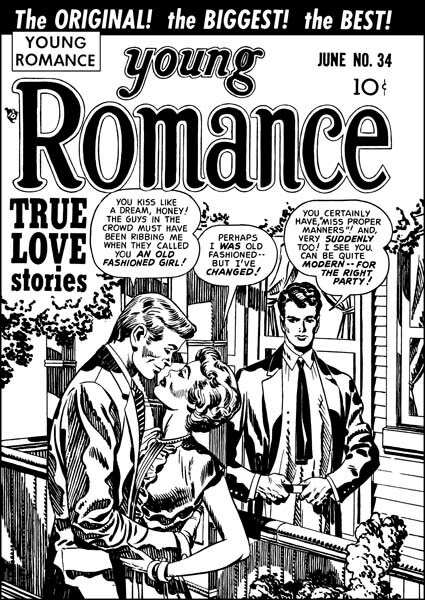 The all important lead stories for Young Romance were all done by Kirby. At 12 to 14 pages long, Jack’s lead stories for YR were longer then the work by any other studio artist (a maximum of 9 pages). But if the primary artist is considered the one producing the greatest number of pages of art, Kirby was no longer the primary romance artists. 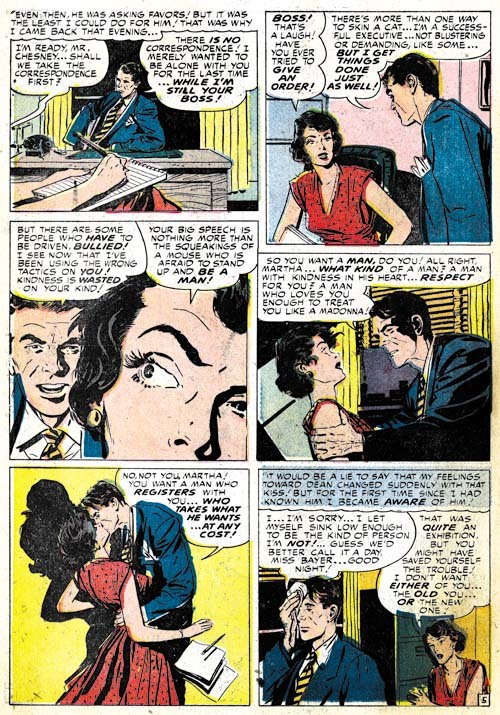 During this period Kirby produced 55 pages of romance art while Mort Meskin did 66 pages. Jack’s work for Boys’ Ranch #3 (February) meant that for February Jack produced the greatest number of pages in the studio for all genres but by April that was no longer true and Mort would take the lead. About three and a half years since the start of Young Romance and Kirby is still finding ways to put special interest into his romance stories. Jack could write a story without action but he certainly like to add it when possible. Who else would use the rough and tumble roller derby world to tell a love story. I often wonder how the original teenage girl readers thought of Jack’s stories but for the modern comic reader there is no question that Kirby’s romance stories are fascinating reads. 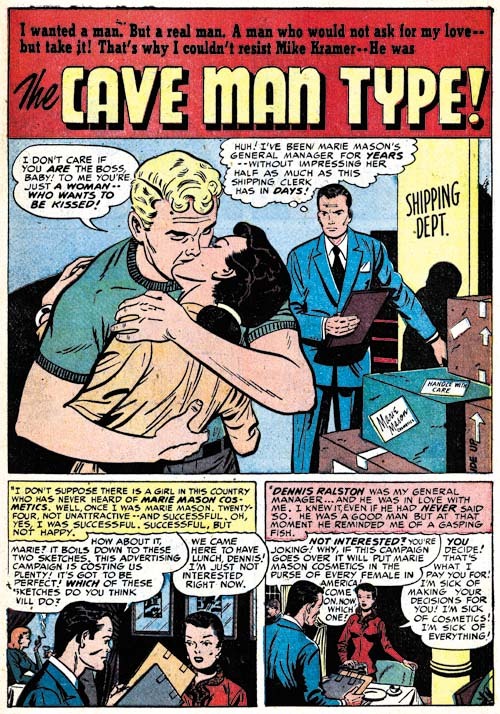 Jack Kirby was not averse to using a love story to tackle social themes as well. “Different” is not really about romance but about intolerance instead. Initially when the family moved into the neighborhood they were well received. Only after the visit of the grandparents reveals that the family’s original name had been Wilheims did the community turn against them. Love is just a background to the story of initial acceptance followed by rejection based only on the towns prejudiced perception of the family’s background. 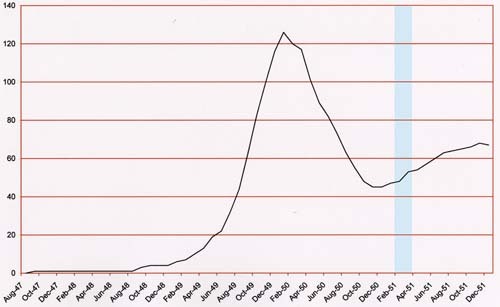 As discussed above, it was during this period that for the first time Mort Meskin output exceeded Jack Kirby’s. Meskin’s art production rate is all the more remarkable considering that Mort did all his own inking while Jack’s work was mostly inked by others. I wish the original art for the splash from “Unwilling Bride” was available as I would love to know how the negative figure of the jailed man was done. The spotting looks like it was brushed with white ink but I would think it would have been difficult to work white over a black background. Would Simon and Kirby have agreed to the extra expense to make a negative stat? However it was done it provides an effective way to put an image to the troubled girl’s thoughts. Once again Bill Draut takes third place in the amount of work provided; 6 stories with 45 pages. Previously Bill Draut’s splash art seemed to be in a bit of a rut; not bad but not particularly exciting. Perhaps because of his work in the new Black Magic title Draut seems to have his mojo working again. Whatever the reason Bill has some nice splashes during this period. 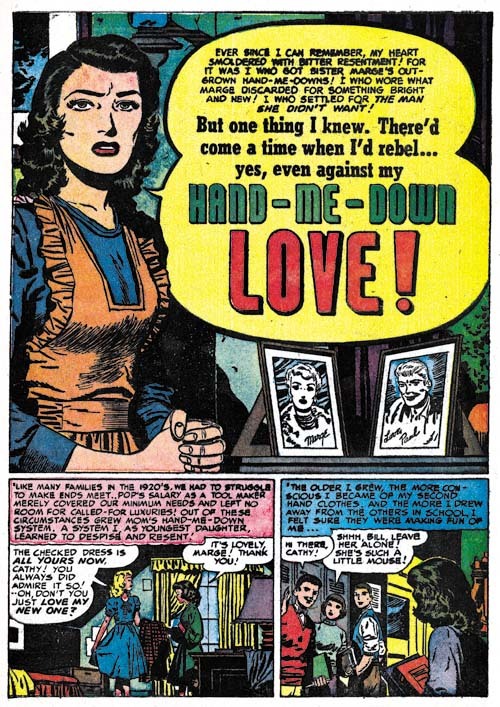 “Hand-Me Down Love” is a confessional splash which makes me suspect that it was originally meant to be the lead story for Young Love but was moved to Young Romance instead. 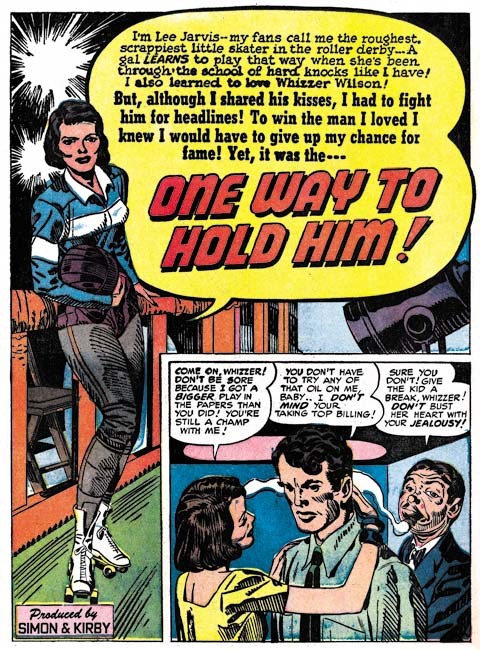 Since Kirby was doing all the lead stories in Young Romance Draut’s work then became one of the backup stories. Like many of Kirby’s romance splashes at the time there really is not much going on but what is presented tells a whole story. The woman’s apron identifies her as a housewife. The drab background with a wall having small flaws indicates her humble surroundings. Two photographs should be her loved ones. The man obviously would be her husband but what can be made of the woman? While the splash tells a story it purposely leaves some things unanswered to entice the viewer to read the story. The fourth most used artist was Marvin Stein with 4 stories and 32 pages. Stein would produce some nice work for the crime titles in the future but at this point his style is a bit clumsy. Some of Marvin’s characteristic traits can be found at this earlier stage, such as the shallow depth to the face of the man in the splash. When inking his own work Stein was always a bit rough but at this point his brush also lacks the assurance he would eventually gain. Without that confidence his inking just looks as clumsy as his pencil work. For whatever reason, Leonard Starr only provided a single story in the period covered in the last chapter but now he does 3 stores with 22 pages. Starr seems to have completely abandoned the tall and very narrow panels that he had previously favored. Occasionally he would divide a panel row into three panels and even more rarely extend the height slightly but the panels never become as narrow as before. For the most part now Starr adhered to a standard panel layout of 3 rows with 2 panels per row. Leonard still likes to use a vertical splash as for example “Weekend For 3”. It was not just Starr’s panel layouts that were evolving. I mentioned in the Chapter 12 how Leonard had begun using a sultrier female along with the more pixie look his females previously had. In “The Cave Man Type” Starr uses what was for him a very different type of man. My database indicates that February 1951 was when Starr would do his last work for Simon and Kirby until 1954 (and I have gone back to verify the attribution of the two 1954 pieces). But originally my database only included a single Starr work for February but with this recent review I now add two more. Considering that Starr stopped providing signatures on his later S&K work and that his style was changing I wonder if I will find more of his work when I write the next couple of chapters to this serial post? 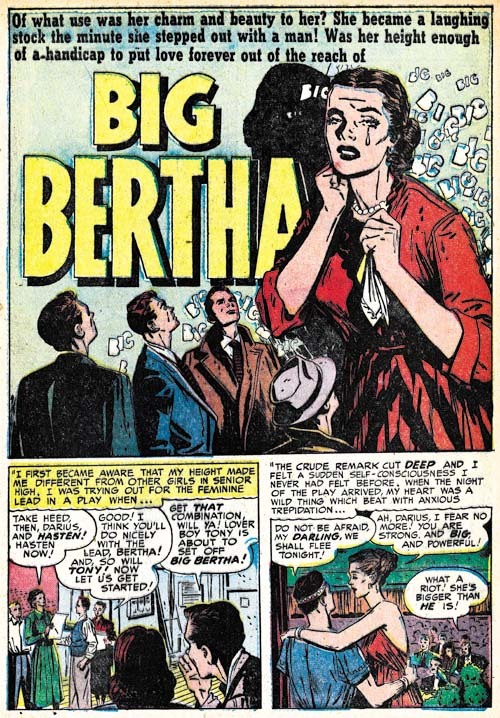 “Big Bertha” from YL #20 marks the first appearance in a Simon and Kirby production of work by John Prentice. My previous short biography on John Prentice (John Prentice, Usual Suspect #3) is seriously flawed* and incomplete and I really should put together a better one. Prior to coming to work for Joe and Jack, Prentice had been working for Hillman and perhaps some other publishers as well. Prentice shared an apartment with Starr so perhaps Leonard aided John in getting work from Simon and Kirby. 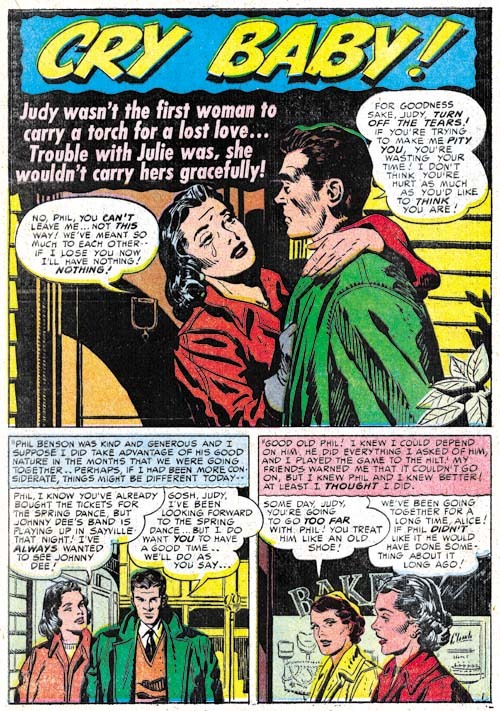 Most artists that worked for Simon and Kirby had adopted (directly or indirectly) aspects of Milt Caniff’s style but John was greatly influenced by Alex Raymond. So much so that when Raymond died suddenly in 1956, Prentice was able to easily take over his syndication strip Rip Kirby. John’s arrival in the S&K studio filled a significant gap created when Bruno Premiani left. Artists would come and go in Joe and Jack’s studio, but the presences of Bill Draut, Mort Meskin, John Prentice, and of course Jack Kirby meant that all Simon and Kirby productions would have a healthy and interesting combination of artists. I have been able to provide attributions for all of the romance work during the period covered by this chapter with the exception of “Later Then You Think”. This looks like the work of some minor artist working from layouts provided by Jack Kirby. Normally when I describe a work as based on Kirby layouts I am uncomfortable using that term because it was obvious that what Jack had provided were very tight in some places. In this particular case that is not true; the artist style is present throughout and no parts have an overly Kirby look. The only exceptions are the photographs in the splash panel that totally look like they were done by Jack. Interestingly the entire story is inked in the Studio Style; shoulder blots, abstract shadow arches, and picket fence crosshatching are found throughout. 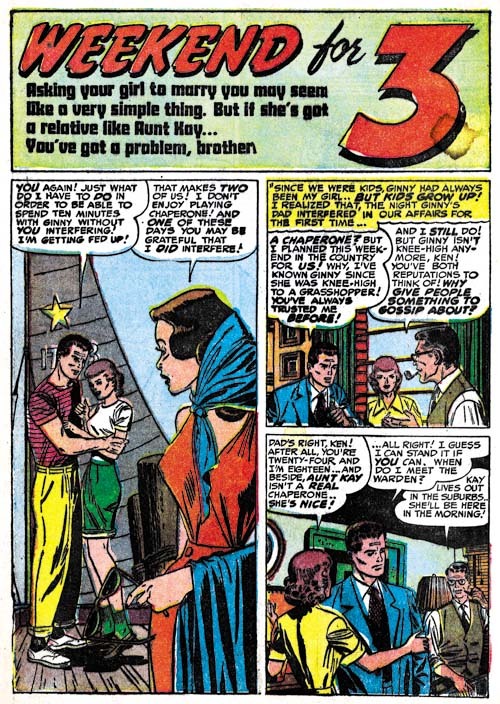 * The most serious error in my previous post on John Prentice is my attributing to him “Two-Timer” from Young Love #4 a piece that I now questionably credit to Bruno Premiani. Recently there was discussion on one of Yahoo’s comic book lists about the correct attribution for the art for Young Allies #1 and #2. I do not want to get into details of that interchange, although I may disagree with some of the participants they are entitled to their opinions. 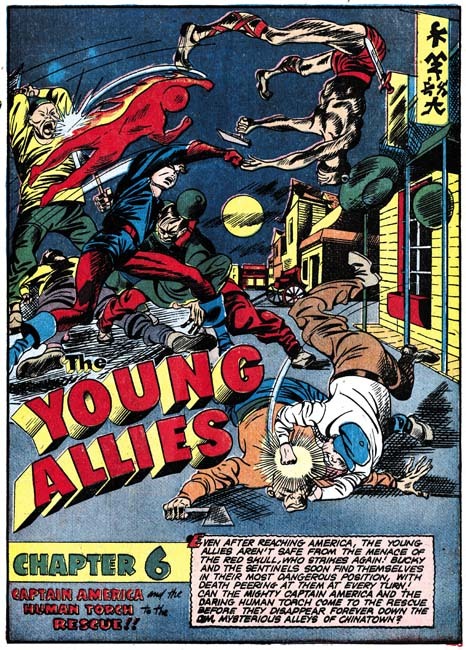 But I thought I would write a post on Young Allies #1 to explain my position. The cover for Young Allies #2 presents its unique problems so I will discuss it some other time. There can be no question about Simon and Kirby’s involvement with Young Allies #1. The punch throwing Bucky on the cover is so typical of Kirby that there can be no doubt that he drew the figure. I would go even further and confidently credit Jack with the Red Skull and Hitler as well. Normally that would be enough for me to attribute the entire cover to Jack Kirby; it was not Simon and Kirby typical procedure for Kirby to draw part of a cover then pass it on to someone else to finish it up (there are two exceptions that I know of, the covers for Detective #65 and In Love #1). Three of the bound Young Allies, those on our left, have enough similarity to other Simon and Kirby creations that I would conclude Jack probably drew them. The soldier firing a pistol is a typical Simon and Kirby motif and although he is a little stiff I would assign him to Jack as well. I do have trouble attributing the last Young Ally, Whitewash, to Jack. 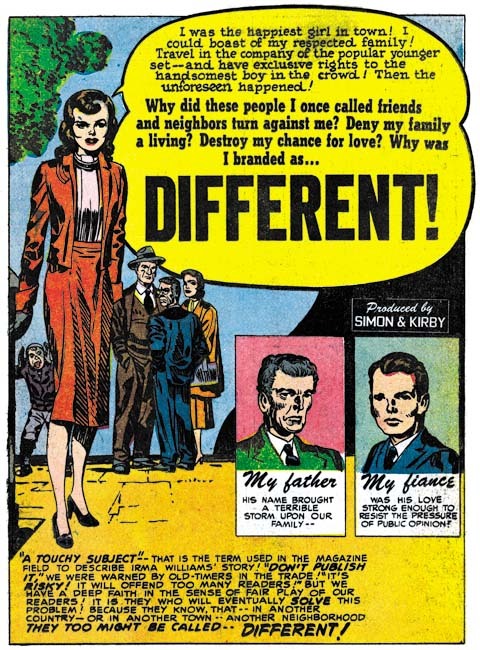 While Simon and Kirby produced some stereotypical characters none of them ever went as far as this troubling image. Finally there is Toro. Frankly there is not much in Toro’s depiction that suggests Kirby but then there is little in the Simon and Kirby repertoire to compare Toro with. To sum up there are parts of the YA #1 cover that clearly were done by Kirby, some parts that might be Jack’s as well, but other parts that may be someone else’s work. I will return to the cover after I have considered the story art as well. The book is one long story with 6 chapters. Each chapter, with the exception of the first, starts with a full pages splash. The first chapter begins with a sort of table of contents in the form of a matrix of reduced versions of the chapter splashes. 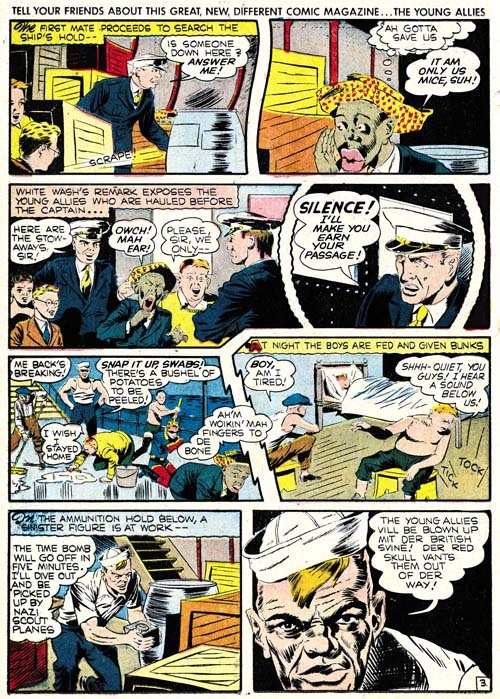 This format of turning the comic into one long story is a device that Simon and Kirby would return to in Boy Commandos. 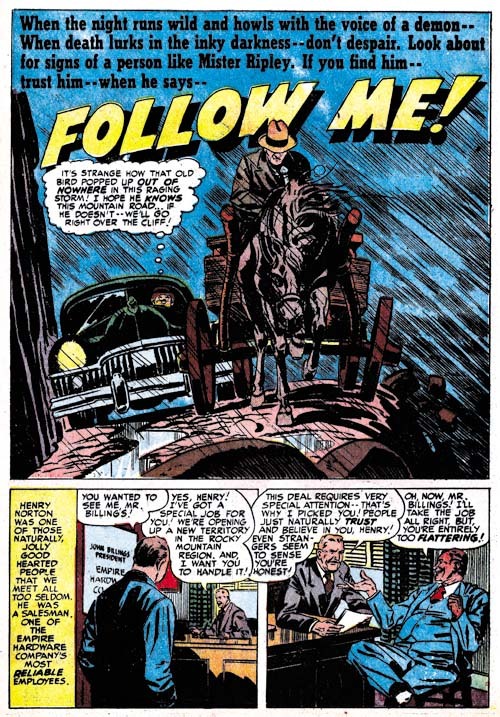 While some of their later work did not take up the entire book Simon and Kirby did return every so often to long stories requiring multiple chapters. It is clear that different hands were involved in drawing this story. The story art certainly was not drawn by Simon and Kirby. I really have not carefully examined it and so I will not be discussing credits for the story art at this time. Although the first chapter actually starts with a table of contents that table includes an image that may have been the originally intended splash. For the most part everything seems drawn by Kirby. Fists are square in shape as is typical for Kirby. Bucky’s legs have a form often used by Jack. Of course nobody could depict a punch like Jack and this is a good example of a Kirby slugfest. In fact we shall see the attribution of this panel to Jack Kirby is the most secure of all the splashes. There are two troublesome aspects and they are the same ones found in the cover: Whitewash and Toro. Toro is an important part of the composition and the fall of the topmost Nazi soldier makes no sense without him. Yet the figure of Toro is as stiff and uninteresting as his depiction on the cover. Whitewash on the other hand just seems out of place. Bucky looks like he could have step out of a page from Captain America and I am quite comfortable attributing him to Kirby. The Red Skull is a bit awkward but this is not unusual for Jack’s work at this period. Otherwise the Red Skull looks like Jack’s work. Note how Whitewash is placed in the background. His attempt to escape the graveyard was meant to provide comic relief but his small size hides what would otherwise be his stereotypical facial features. Once again Toro seems stiff and uninteresting but still plays an important part of the composition. 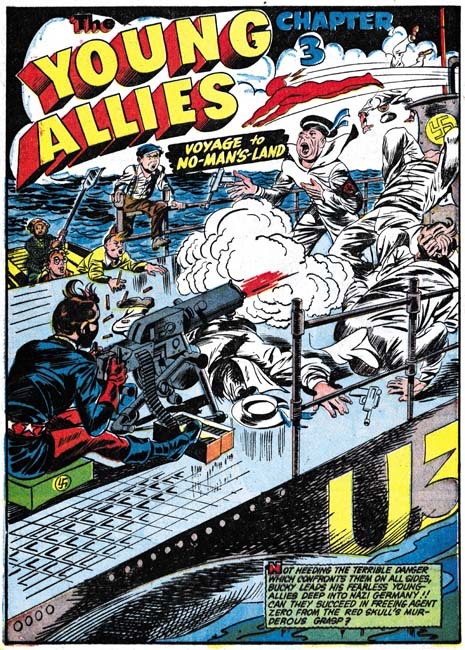 I am not sure why anyone would have problem with Chapter 3 being penciled by Jack Kirby; what with square fingertips, Bucky’s wild hair, and the disarrayed posses of the Nazi seamen. This splash more then any of the others is centered on Bucky with all other Young Allies delegated to the background. Toro, with his stiff flight, seems little more then a smaller version of the Toro depicted on the cover. Only in the splash for Chapter 4 do we find some decidedly non-Kirby elements. While there are some square fists (a cautionary example to depending on this trait alone when identifying Kirby art) the rest of the hands look very different from Kirby’s usual manner. 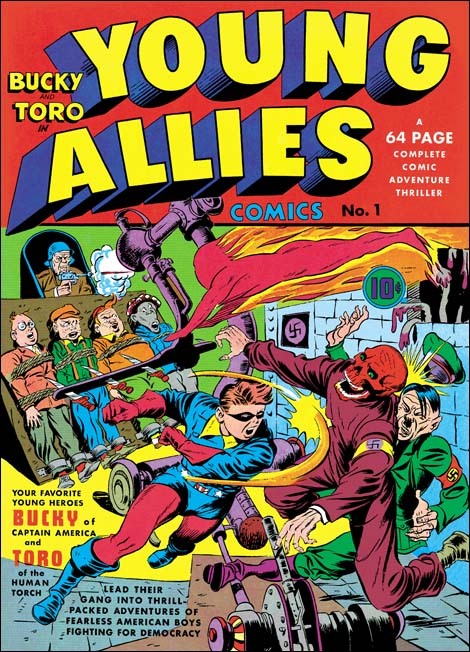 The pile of Young Allies pinning Hitler lacks the action of typical Kirby art. Even the heavy boy’s readiness to use a hammer on Hitler’s rear end is not typical Simon and Kirby humor. Bucky has not only been placed in the background but now Whitewash gets to be the centerpiece of the splash which makes his stereotypic features all that more repulsive to our modern sensibilities. Toro is given the most dynamic pose of all the splashes or the cover. In short I do not think Kirby had anything to do with this splash, nor for that matter Joe Simon. 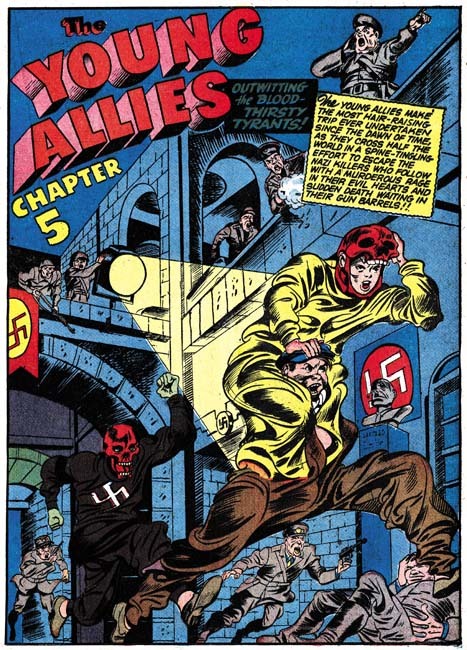 The low viewing angle, the wide running stance of the Red Skull and the lower of the two Boy Commandoes Young Allies, and the soldier firing his pistol from above all are classic features of Jack Kirby’s art. Also note the Red Skull’s square fists; while I caution against depending on this feature its presence should not be ignored either. There is a crudeness to the art that makes this splash distinctive compared to the other splashes we have examined so far. Most Simon and Kirby splashes and covers have an emphasis on design that makes me believe that they had been laid out by Joe Simon (see my serial post The Wide Angle Scream). But there are others where the figures are distributed all over the image and interlink with one another like some complicated puzzle. I believe these “all over compositions” are Jack’s alone. The splash for Chapter 6 is an example of this type of composition. Jack really did not try to provide accurate anatomy but he paid careful attention to the underlying form. Kirby might distort the figure but he always did it without “breaking” the structure. It is just that sort of distortion that is found here in the legs found on Bucky and his thrown (and barely clad) opponent. Some of the Young Allies have been excluded from this splash, in particular Whitewash. Toro gets one of his most energetic posses but he still presents a stiff and awkward appearance. Now that the cover and all the splashes have been presented what can be concluded? As I mentioned above the splash for Chapter 4 does not seem to me to have any significant Simon and Kirby involvement and I will be excluding it from my discussion. Otherwise all the splashes and the cover had Simon and Kirby involvement at some level. Jack Kirby brought to Captain America a dynamic art style that no other artist at that time came close to. That dynamism is found in the cover and all the splashes (again excluding Chapter 4). 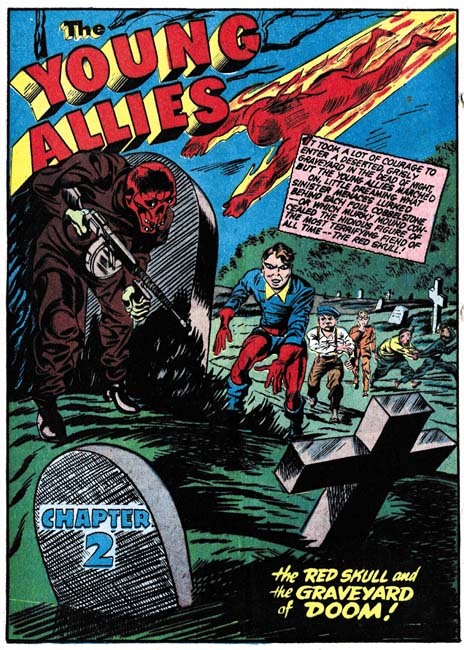 While Simon and Kirby’s presence seems pretty certain much of the art seems crude compared to what Kirby was penciling in Captain America at the same time. Although Joe may have been involved in some of the inking, I do not think Simon was stepping in to help with the pencils either. Thus one or more other artists are likely to have had a hand in this work as well. It was probably the combination of the Kirby dynamic action with the crudeness of the drawing that has caused some to use the L word. Yes some are saying Kirby only did the layouts. Frankly I am getting pretty disgusted with the L word when applied to Jack Kirby. Normally when the term layouts implies that one artist would provide very rough or outline drawings with another artist then providing the details. A good example are the layouts that Carl Burgos did for Joe Simon (Carl Burgos does the Fly). When I say that I believe Joe would often provide Jack with a splash or cover layout that is what I am talking about. 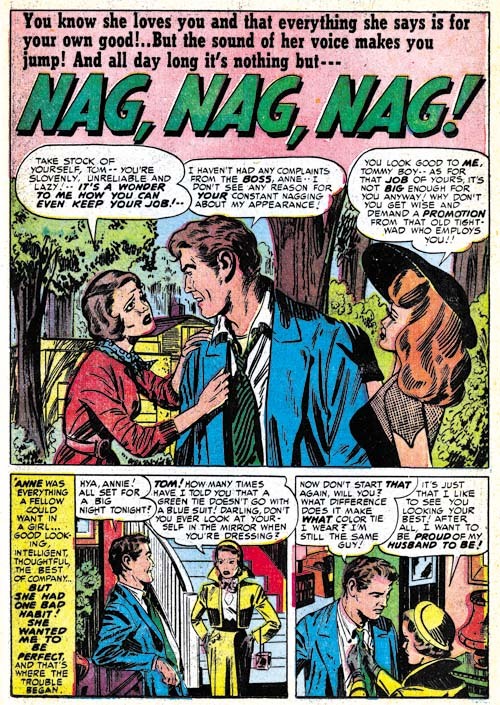 But my study of Simon and Kirby productions (particularly the romance comics) and Marvel silver age comics convinces me that Jack never did layouts of that type. Unfortunately we no longer have any examples of Kirby “layouts”, that is those left unfinished by another artist. But it is obvious even in the finished product that Kirby provided much more then mere outlines. Kirby “layouts” may have been a little rough but they were tight enough that his hand is still often detectable in the final product. In some places Kirby’s presence would be so strong that Jack must have provided very tight drawing. To call this type of work layouts is completely unfair to Kirby. Frankly I blame Stan Lee for first using this term for some work that Jack did during the 60’s. The only problem is that I have yet to come up with a better term. However it is clear that the proper credit for the pencils for cases like the cover and splashes for Young Allies is that Jack Kirby drew them working with other artists. As for Young Allies I believe the cover and splashes (still excluding Chapter 4) all were done by Jack Kirby but with some portions tighter then others. Bucky invariably got the best treatment and Toro the roughest. It may sound like heresy but I do not believe that at this time Jack had any idea how to handle a human torch and since it was someone else’s creation little interest in figuring it out. While Kirby would carefully place Toro into the composition he left it the finishing artists to flesh him out and frankly they were not up to the job. As for Whitewash Kirby always seem to place him far in the background of the splashes, or leave him out entirely. I suspect that Jack really was not comfortable with Whitewash and this suggests that his presence in the Young Allies was dictated by someone else.